1. You’ve been living in Thailand for how many years now? Is it having an influence on your artistic practice? Getting on for nine years. I learnt sculpture here, so a new door has definitely opened. So far I’ve drawn ideas mainly from my own background, though I can see a Thai influence coming in here and there. I have a few ideas for pieces inspired by Thailand, but haven’t got going on them yet! 2. Do you find the themes of your fiction showing through in your sculpture? What is that sculpture does for you, that the words do not? Yeah, I think they do show through. Or they’re just things I’m obsessed with that turn up whether I’m writing or making art. Loneliness, insanity, cheerful stuff like that. Masks. I’ve made a couple of minotaurs and a creepy baby that might look familiar to people who’ve read The Etched City. But I also find that sculpture gives me a visa to a few places I can’t manage to go to with writing. I happily get quite traditional with sculpture. I made a figure of a dancing Pan, playing his pipes – nothing weird or surreal about him. I don’t know how to write about a purely magical otherworld, but it’s been calling to me lately when I sit down with wax. 3. Your Aurealis Award-winning collection, That Book Your Mad Ancestor Wrote, shows a breadth of the fantastic, from an Ashamoil scene of Gwynn dealing with the paparazzi, to a take on Beauty and the Beast, to conspiring curtains. Where is your fiction heading? What can we expect to see from you next? Will you have a new sculpture in your pocket at Loncon? I’ve learned not to jinx writing by talking about it. At the moment I’m not writing much, which isn’t to say I’m not writing at all. Maybe I should just say expect the unexpected? I’ll have some work in the art show at Loncon. My pockets are more likely to contain yucky bits of melted chocolate. I chose to self-publish Mad Ancestor through Createspace, and did all the work myself. Would I do it again? I’d certainly consider it, though it was hard yakka, especially doing my own copyediting. I read a lot of dead authors, and expect I’ll still be reading them in five years. 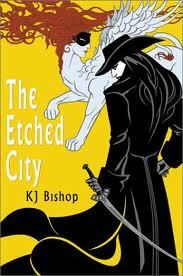 This entry was posted in books, writing and tagged 2014snapshot, kj bishop. Bookmark the permalink.